This article was featured on Luton Council of Faiths' website. Saturday June 13, saw the first Fairtrade Muslim Asian Tea & Coffee shop in Bury Park. The event was organised by Grassroots which is leading the project to make Luton a Fairtrade Town, with its partner Luton Council of Faiths. Both organisations set up a multi-faith and multi-cultural steering group to reflect the diversity of the town but more to raise consciousness and awareness of different communities in Luton about trade and justice while putting faith into action. The Saturday event was a landmark in the ‘Making Luton a Fairtrade town’ campaign in engaging the Muslim Asian community in such an initiative. Shahed Koyes owner of the Coffee Pot which is at the heart of Bury Park answered this call for trade justice and offered his support to ethical and Fairtrade. The day saw the official launch of his Fairtrade Coffee Pot with Political dignitaries and leaders of different faiths communities present. Bilal Hussain, Trustee of The Fairtrade Foundation and Zafar Khan, Chair of Luton Council of Faiths welcomed everyone. Peter Adams from Churches Together in Luton and Dr Fiaz Hussain from Luton Council of Mosques responded on the role of faith communities in promoting Fairtrade. Aware of the role of LBC, local Councillors have agreed to participate in promoting Fairtrade and committed themselves in public for this cause. Shahed Koyes briefly spoke about his action to support Fairtrade and Peter Kotecha from the Bury Park Traders Association referred to the sufferings of people from the Third World who deserve a fair deal for their hard work and also promoting fair-trade as means of achieving trade justice, empowering those at the bottom of the ladder. The Mayor of Luton, Cllr. 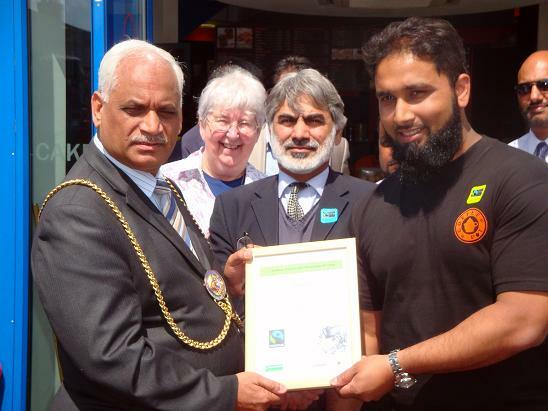 Mohammed Riaz presented Shahed Koyes with a certificate in recognition of the inauguration of his Fairtrade shop, which was kindly endorsed by The Fairtrade Foundation.The event was also about concrete action for promoting social cohesion where Shahed sponsored fairly traded footballs which were given to the Mandip Mudhar Memorial Foundation, which organises a football tournament each year. This year it will be held on Saturday, August 1. The football tournament, which attracts some 300 players from different backgrounds, will be Fairtrade this year with the support of Luton Council of Faiths and its partner Grassroots and Inspired Sporting Challenge and Culture Link Alliance. Stephen Brown from Luton Town Football Club showed his great appreciation of this community initiative and look forward to support Fairtrade by the Local Town Football Club. The day’s ceremony ended with a few words from Maureen Borbone, Trustee of Grassroots and an ardent activist in making Luton a Fairtrade Town. All present enjoyed Fairtrade refreshments kindly offered by the Coffee Pot. Fairtrade activists continued the day having a stall at the Coffee Pot to promote and raise awareness of Fairtrade where the public could enjoy a taster of Fairtrade chocolates, sweets and Bombay Mix, all sponsored by the Coffee Pot.